Caption slip reads: "Photographer: Olmo. Date: 1957-12-30. Reporter: Adler. Assignment: Holduppers. 5-6: Suspect Roger A. Hoskins, 19, at Inglewood station. 9-10: Suspect Howard Scott, 19, in Inglewood jail. 7-8: Inglewood Officer Tony Mascola holding two phony guns found on suspects. 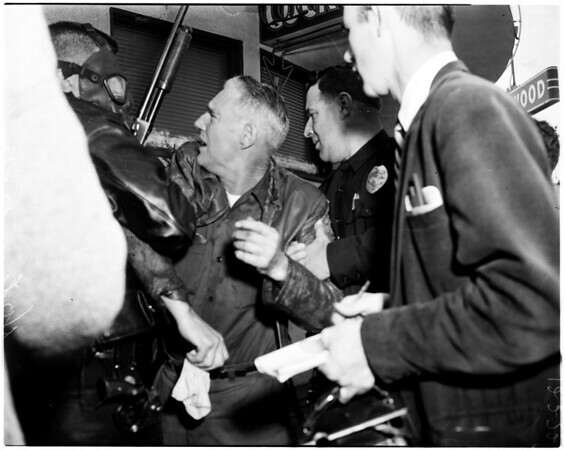 1: Suspect Howard Scott, nylon stocking over face, emerges from rear door of bar with hostage Evelyn Shane ahead of him. Tear gas slightly envelops [sic] them. 75/76/77/78: Suspect Howard Scott and hostage Evelyn Shane behind broken window in back entrance of bar, try to get fresh air after tear gas had been shot through door. 2. Roger hoshkins, susp. 3: Hostage James Triggs". Edits: "Suspect Howard Scott, nylon stocking over face, emerges from rear door of bar -- with hostage Evelyn Shane ahead of him".